About half a year ago Apple launched their 5K monitors which we assumed that will create a whole new megapixel race aimed not at camera sensors, but at computer monitors. And while we are not free of the megapixel race with the DSLR market, the monitor’s pixels wars are heating up. So here we are with no Apple confirmation of this alleged iMac 8K, yet LG seems to be certain enough to share this info on their press briefing. 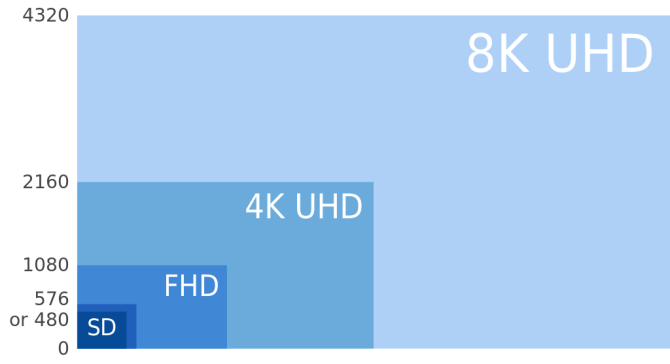 The chart below illustrates how big 8K is. Why would you use an 8K monitor? This would be great for editing movies at 4K. As a single 8K monitor can hold 4 4K screens on a single edit. It would also be great for editing images. The question is what hardware will push this monitor…. 8k is not 4x larger than 4k… simple math… get it right. 2 times the dimensions = 4 times the area…simple math…get it right. thought. simple spelling. get it right. thanks for the catch spelling guy!